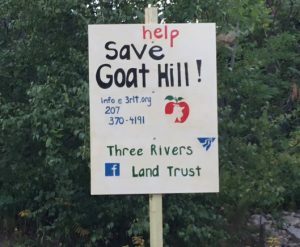 RuthGutman August 12, 2016 Comments Off on Help Save Goat Hill! We hope everyone is managing to stay cool during this blistering wave of heat and drought we’ve been experiencing this summer. Hopefully many of you have had a chance to swim in one of the beautiful lakes in the area. If you have, or you are lucky enough to live on one, then you know what a precious resource they are and how much they add to the special nature of our area. We hope by now you have heard of the Goat Hill/Romac Orchard conservation project that is now underway in the town of Acton and our surrounding communities. The Romac Orchard on H Road in Acton has been for sale for a few years now, and Three Rivers has reached an agreement with the landowner to oversee a sale of the property so that it will remain undeveloped for future generations to enjoy. The town of Acton voted in June to put forward $100,000 toward the purchase of the top 25 acres, which would be open to public recreation. The pine stand at the top of the hill can be seen from miles around, and from the top you’ll find a unique view of Square Pond, Wilson Lake, and on a clear day in the winter, Great East and Mount Washington. It’s really spectacular! The rest of the orchard will be sold to a farmer to remain as farmland. Three Rivers is currently trying to raise the rest of the money needed to complete the purchase: $180,000. This is our biggest campaign to date and the most money we have ever needed to raise from private donors, thought we continue to seek funding from public grants and private foundations. If you are able to make a gift right now to “Help Save Goat Hill” we hope you will help us out and be a part of saving this wonderful spot for public enjoyment and the continuation of a farm many of us remember from our childhoods. In addition to significant gifts, we are also looking for new members! This helps us prove to foundations and grant funders that we have community support. So whether you can donate $20,000, or $20, we would love to hear from you right away. For more information please contact Ruth Gutman at info@3rlt.org or (207) 370-4191. She can answer any questions you may have and also make sure you get more information about the project. Thank you from all of us at Three Rivers Land Trust.